Soft gray and gold veins. Light to medium veining. 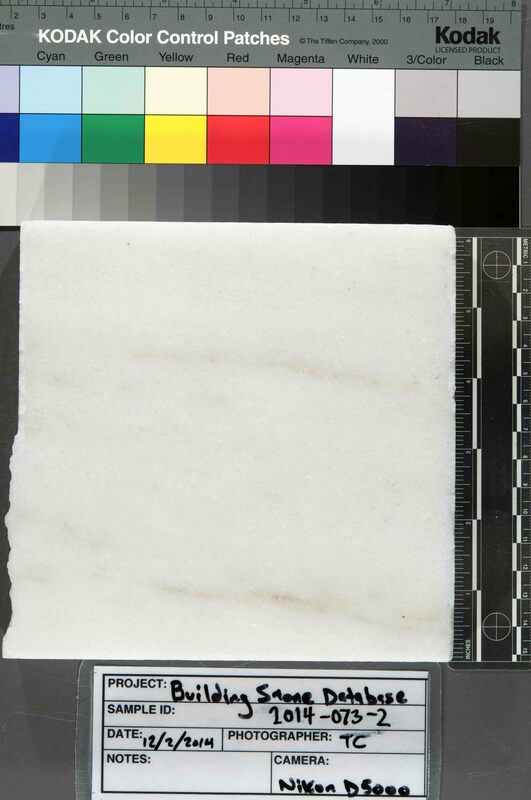 This sample is a moderately coarse grained marble. The texture is overall granoblastic with random grain orientation. Maximum carbonate grain size is around 1.8 mm, minimum is .1 mm, the modal size is .4 to 1.1 mm. Grain boundaries are mostly curved or straight with a lesser amount of sutured boundaries. Twinning lamellae in carbonates are common. The most common non-carbonate accessory minerals are micas (phlogopite, muscovite?) and acicular minerals (sillimanite?) 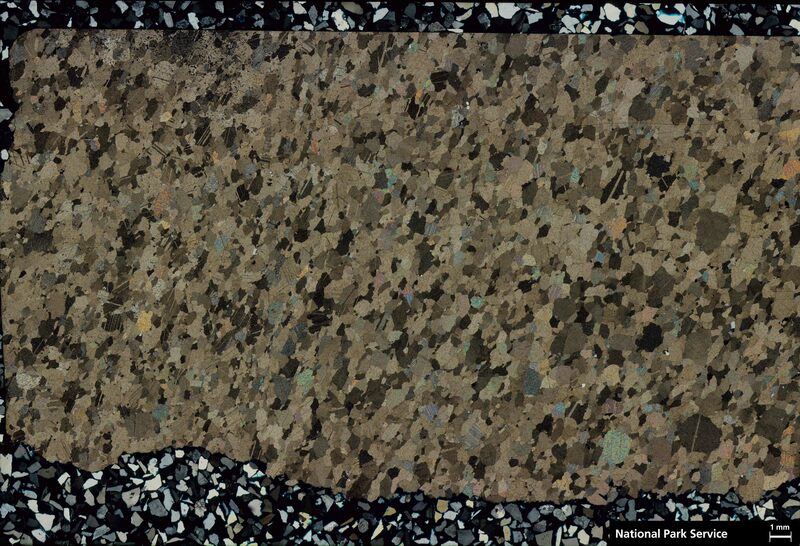 that occur in aggregate bands up to .45 mm in width and over a 1 cm in length. Other accessory minerals include individual and aggregates of small quartz and feldspar grains. Individual quartz grains have a maximum dimension of .4 mm. Very rare opaque minerals, likely magnetite, also occur individually and within mica aggregates. All accessory minerals constitute less than 5 percent of slide area. 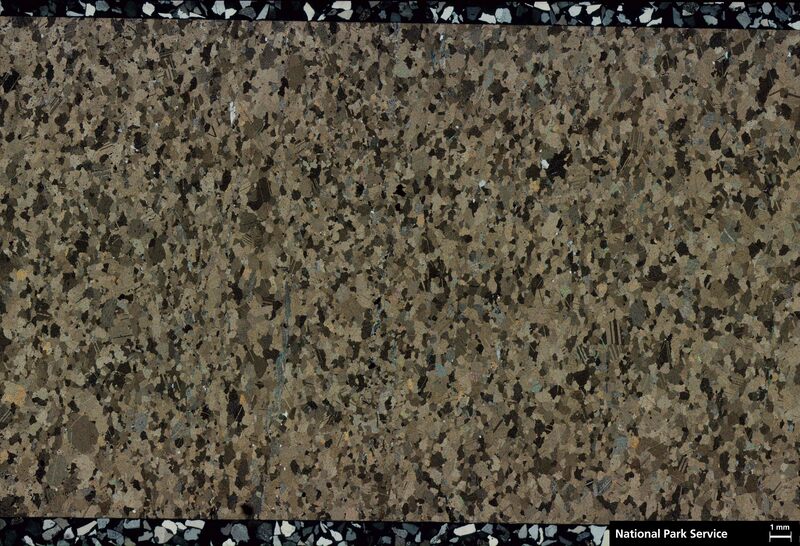 The aggregate mica mineral clusters create a localized banding appearance. Diffuse banding is also visible in the hand sample. There is no appreciable weathering in this sample. 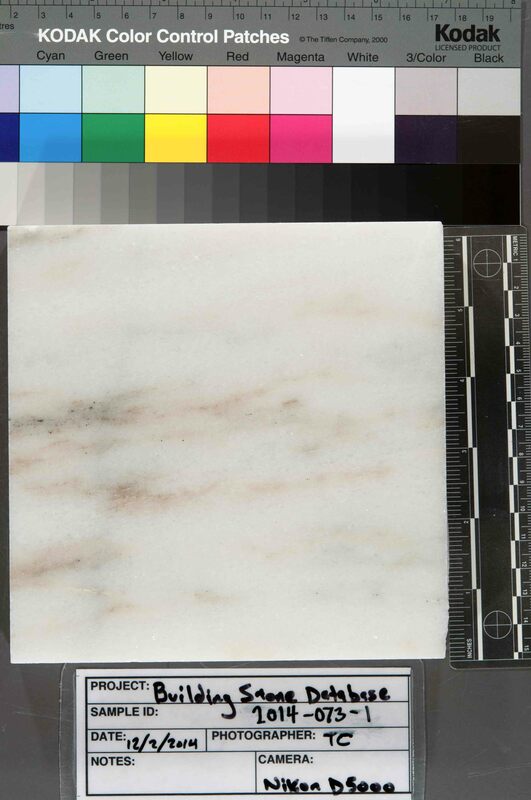 This sample is a relatively coarse grained marble. The texture is overall granoblastic with random grain orientation. 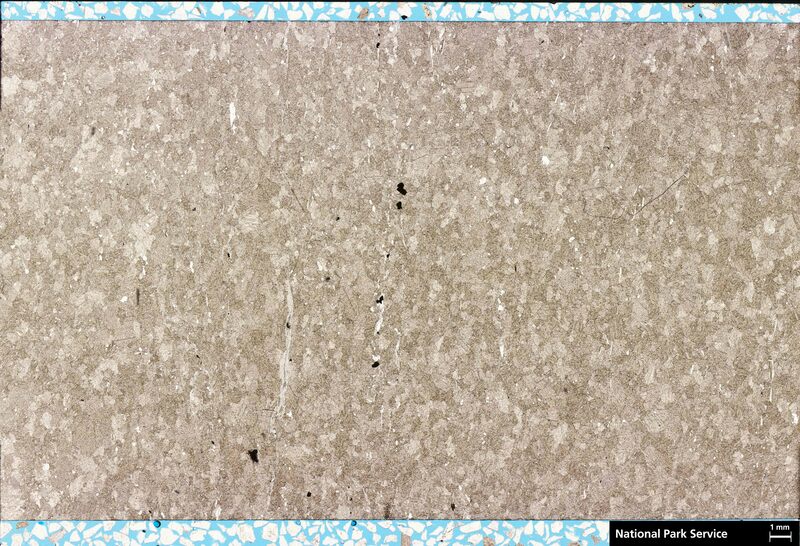 Maximum carbonate grain size is around 2 mm, minimum is .1 mm, the modal size is .5 to 1 mm. Grain boundaries are mostly curved or straight with a lesser amount of sutured boundaries. Twinning lamellae in carbonates are common. The most common non-carbonate accessory minerals are micas (phlogopite, muscovite?) that occur in small aggregates (< 1 mm length) or as individual crystals (~.25 mm). Other accessory minerals include individual and aggregates of small quartz and feldspar grains. 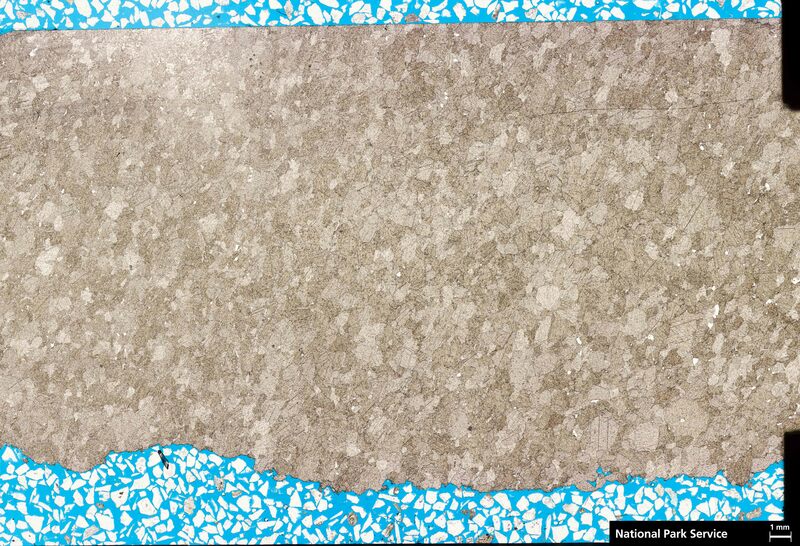 Individual quartz grains have a maximum dimension of .5 mm, most are significantly smaller. Opaque minerals are present only in trace amounts. All non-carbonate accessory minerals constitute less than 1 percent of slide area. Mica minerals show a generally consistent direction of elongation, but are too dispersed to produce any appreciable macrostructure banding. Minimal diffuse banding is visible in the hand sample. There is no appreciable weathering in this sample.